Chestnuts grow on trees and bushes throughout the world. In ancient China, chestnut was a part of a daily menu. Europeans also consume this powerful food for about 3,000 years. Chestnuts have a lot of surprising health benefits and are richer in nutrients than other nuts. One of the benefits is a positive effect on diabetes. Namely, chestnuts contain a huge amount of fiber that can prevent and regulate diabetes. It belongs to low glycemic foods and can significantly help people with diabetes. Another benefit is evident in patients with high blood pressure and cardiovascular problems. Chestnuts possess a lot of potassium and good fats that regulate blood pressure, keep cholesterol in balance, prevent blood clots, etc. Because of that, people who are prone to heart problems may add a cup of chestnuts in their diet. People who frequently catch the flu, or have some other form of low immunity may benefit from eating chestnuts. Studies have shown that this nut is highly nutritious and rich in vitamin C, minerals, vitamins, and antioxidants. It is more than a coincidence that this nut is available in autumn when our bodies need more quality foods and important nutrients. To learn more about the health benefits of chestnuts the article “Chestnut 15 Health Benefits “ lists the following. As every sort of nuts, chestnut is also good for our brain health. It contains vitamin B complex that may improve our brain functions. Interestingly, the chestnut has a powerful effect on bone density. 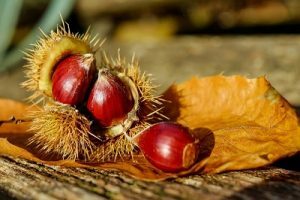 Medical experts believe that copper and magnesium found in chestnut can prevent osteoporosis and other age-related diseases. People who suffer from some kind of chronic disease may benefit from eating chestnuts on a daily basis. Studies have revealed that chestnut has powerful antioxidative effects that soothe inflammation processes in the body and eliminate free radicals from an organism. Because of these strong health benefits, it is worth finding out how to prepare chestnuts as a tasty dish. Previous story Is Happy Marriage Really Possible?